The weight went back down this week, though not quite as much as I’d hoped. It was 246.4 when I got up, which is a 1.6 pound loss over last week. Well, one takes victories where one can, eh? Plus, I did eat rather late before I went to bed, which I’m sure didn’t help. 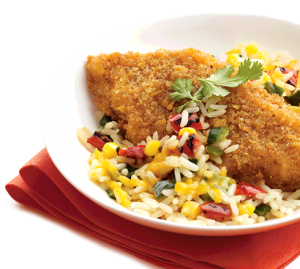 I tried only one new meal during my time off — Lean Cuisine’s Tortilla Crusted Fish. 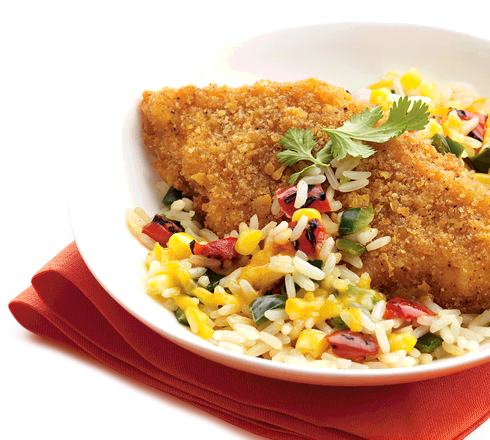 The Lean Cuisine folks seem to have a thing for Southwestern styled foods, as the side dish was very Southwestern. I would have preferred mashed potatoes or some seasoned rice. Otherwise, it was pretty good, but I don’t think I’ll get it again. I did try KFC’s grilled chicken for the heck of it. Well, to be honest, it was because they ran out of original chicken breasts when I ordered due to large orders in front of me. Since I didn’t want to wait ten minutes (or more) for it to cook, I just had them throw in the grilled chicken. I was surprised at how good these were. Granted, it wasn’t as good as fried chicken, which is what I had a taste for, but it was still pretty good and went well with the Japanese rice I had. Kinda busy at the moment, so I’ll skip writing more for now. This entry was posted in Weight Loss and tagged 5:2 Diet on April 4, 2013 by AstroNerdBoy.